Your family is your heart. We understand that when any member of a family hurts, the whole family hurts too. We know that regardless of your circumstance or events, your family deserves wellness and happiness each and every day. At the Family Guidance & Therapy Center, we serve the whole family with therapy designed to help you heal from issues such as trauma, grief, substance abuse, depression and anxiety in order for you to get the most out of your relationships. There is no way to quantify your love for your loved ones. 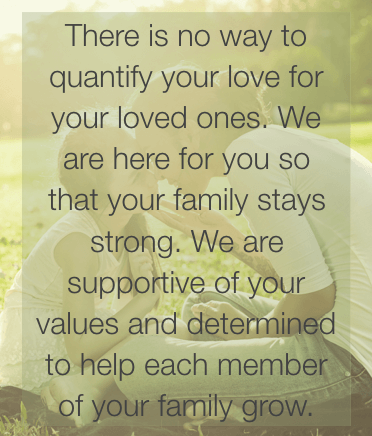 We are here for you so that your family stays strong. We are supportive of your values and determined to help each member of your family grow.